In this update, the Canvas Teacher app supports allowing users to comment on announcements, inserting an image in the Rich Content Editor by taking a photo or selecting an image from your device, and copying links to files. In DocViewer, users can undo and redo annotations and delete other users’ comments and annotations. Download the Canvas Teacher app in the Google Play store. Version 1.6 requires Android 5.0 or later. 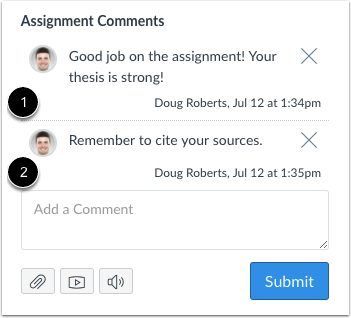 Announcements supports allowing users to comment on course announcements. As part of this update, the Users must post before seeing replies option can only be managed if the Allow users to comment option is enabled. DocViewer supports undoing and redoing annotations. Files supports copying links to course and user files. The Rich Content Editor supports inserting an image by taking a photo or selecting an image from your device. These options replace inserting an image by pasting a link. DocViewer supports deleting annotations and comments made by other users. In order to delete an annotation or comment, a user must have the appropriate permissions. Wait... one of the hugest RCE problems is the inability to take/upload an image and immediately add to a discussion, etc. So now you can take a photo and directly upload, but only in the Android teacher app? When is this coming to the student app? When is this coming for the apple apps? WHEN IS THIS COMING FOR DESKTOP!!!??!! I am really happy for the Android tablet users too, how about the rest? My students are using chrome books, and teachers use PCs and Macs most often. Canvas developers, Please make it equitable for all! Regarding the "Delete Annotations from Other Users" will there be any tracking or recovery possible for those annotations? Once a comment or annotation is deleted in DocViewer, the user who created it should still be able to view it in the browser version of Canvas and have the opportunity to delete it themselves. It will be hidden to everyone else. There is no way to un-delete it and this same option is not available in the mobile apps. If you are looking to find a deleted comment or annotation, I would suggest contacting Canvas Support to see if that is something they can find for you. Cody Titmus. I'm an Admin. I don't want to have to open up tickets every time a teacher deletes the wrong comment or worse, deletes something from the wrong student; not to mention getting into "student says, teacher says" cases because there is no tracking or ability to see deleted comments. Especially since this option is "Delete Annotations from Other Users"
Susan, the use case you shared for this subsidiary feature idea is important, but I think you know that for it to be seen by the greater group it will need to be submitted as a new feature idea. Please do submit it as a new idea so that others can share their thoughts and use cases. Thanks. I'm looking at my Teacher app on my Android phone now, and as far as I can tell there's still no mechanism for deleting these comments. Perhaps either Gregor Bowie (the OP) or Renee Carney can clarify?